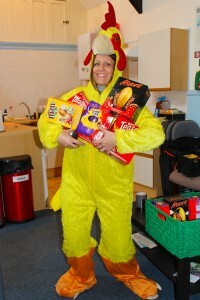 In just over a week, our staff and some volunteers will put on their onesies for a day at the office. For some of our staff this event presents a challenge, for others it is a walk in the park, however, for all it is unusual to adorn one’s pajamas in work! We would love you to come and visit us at our Stanley Road Headquarters on Thursday 24th March to see us all looking great, sponsor us, and pick up a cake at a small donation to a wonderful cause. We look forward to seeing you soon, pictures of the event will follow! The Schools Team have started their Easter assembly tour and will be touring the Schools of the city all month. The team are using the popular image of the Easter Egg, using one that is over 1 metre tall, created after a long papier mache project! 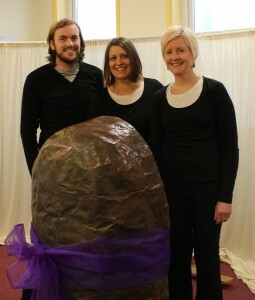 The team will be moving the ‘egg’ around in such a way to represent different parts of the Easter Story. Using actions and sounds the team hope this assembly will tell the Easter story to those who are unfamiliar and reaffirm it for those to who it is known. The teams hope is that when children are back at home they are reminded of our assembly and subsequently what Jesus did for us all, as they open their own Easter gifts. The assembly will share of Jesus’s death and resurrection slightly differently, using less media and the team feel it will be just as effective in sharing the message, already the children have been wowed how the ‘chocolate egg’ can become the manger and then transform into the basket for bread and fish!